Barbeque grease and fat, red wine spills, coffee spills, dirty muddy footprints, dogs and cats, your average deck see’s more action than just about any other part of your home. All these thrills and spills would spell disaster for other types of deck boards but composite decking takes all these in its stride. Simply wash off with a bit of soap and water and your composite Deck will look like new again. Composite Decking has a patent pending surface coating which inhibits fading because of its UV stabaliser and antioxidant additives. Composite Decking has a SuperDurable High-Density Polyester Powder Coat which exceeds international standards for colour retention. 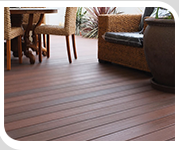 Composite Decking is Termite resistant. Composite Decking Material are made from high-density polyethylene mixture or full Aluminium construction , our deck boards are not on the menu for termite’s and white ants. It’s great that modwood is actually fade resistant! We live in a pretty sunny area, and it would be really sad to see a deck get sun bleached. It’s great that his product will keeps its color, even in the sun.